Brief Description: How good are you at getting about the UK using the road and motorway network? 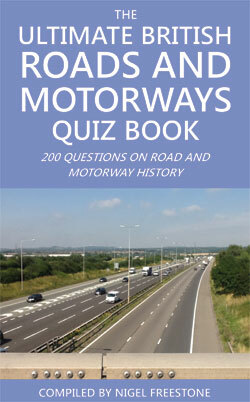 The Ultimate British Roads and Motorways Quiz Book has been compiled to test your knowledge of all aspects of the British roads and motorways. What was the first main road in Britain? What is the only town in the UK to have its own numbering system, H and V roads? In what year was the 70mph speed limit introduced on an experimental basis? The M6 motorway is carried across the Manchester Ship Canal and the River Mersey by which viaduct? Which London landmark forms a major road junction connecting Oxford Street to the east, Park Lane (A4202) to the south, Bayswater Road (A402) to the west, and Edgware Road (A5) to the north-west? The answers can all be found inside this handy new book. With 200 challenging British road and motorway-related questions from the longest, the shortest, the highest and the lowest through to routes and destinations, you are certain to learn something new. This is a must-have book for anyone who drives. About the Author: Nigel Freestone has spent his working life in education and is currently Head of the Department of Environmental Sciences at the University of Northampton. Educated at Beaumont Leys school and at the University of Leicester he is a lifelong fan of Leicester along with his late father, brothers and sons. He has compiled crosswords, puzzles and published numerous historical features on football, motoring, fishing and chemistry. Married and a father of three, he devotes his spare to watching the Foxes, listening to radio comedy and enjoying the countryside walking his dogs.